What is a Florida Sublease Agreement? Florida Sublease Agreement: What Is It? In Florida, a sublease agreement is a legal agreement between two tenants; one who will be moving out of a rented unit and one that will be moving in. A sublease agreement grants the sublessee (the incoming tenant) the right to move into the unit and pay rent while the sublessor is gone. Sublease agreements are often temporary agreements lasting for a few months, but sometimes a sublease agreement can last for the duration of the original lease agreement. These type of agreements often come into play when the original tenant needs to relocate for a period of time. These types of situations often occur because of a family emergency, a contracted job, or military deployment. In these cases, the two tenants may agree that the sublease agreement will last for a period of months and will end when the sublessor returns. Other times the sublessor does not plan to return and the two parties agree that the sublease agreement will last until the lease term is over. This situation can occur if the sublessor has purchased a home or will be permanently relocating and has no intention of moving back into the rental. Regardless of the terms and conditions, it is very important to have a sublease agreement in writing in order to protect both parties. Florida Landlord/Tenant Laws do not prohibit subleasing, however, they suggest that a tenant should always receive written permission from a landlord before proceeding with a sublease agreement. 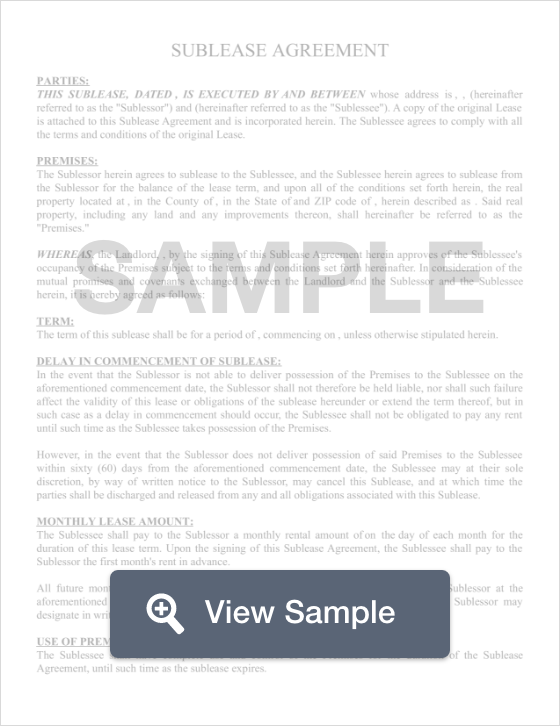 Furthermore, if a lease agreement specifies that subleasing is prohibited, then a tenant should not proceed with a sublease agreement.